In this post I've tried to bring together Ramaswami's guide to practicing Vinyasa Krama as outlined in his September 2009 Newsletter ( this newsletter lives permanently as one of the sub pages at the top of this blog). Claudia once expressed the wish for bullet points and so I've tried to break the newsletter up in such a way to as to make Ramaswami's practice guidelines as clear and approachable as possible, I hope this meets with his approval. I've not added anything but have cut out a couple of explanatory passages so I recommend reading the newsletter in full, in it's original format. The second part of this post contains 10 sample practices design by Chris, a fellow teacher trainee on Ramaswami's 200 hour VK TT course last year held at LMU in LA. Chris stresses that they were designed for his own personal practice. Taken together they cover most of the postures, subroutines and sequences found in Ramaswami's book Complete Book of Vinyasa Yoga. They can be taken as individual sample practice ideas that one might like to try or just as sketches, illustrations, of one the myriad ways Vinyasa Krama practice might be approached. My own Sister Blog Vinyasa Krama sequences and subroutines has practice sheets of all the major sequences in Ramaswamis books as well as videos of the individual subroutines. It also has some pranayama instruction videos. My own personal practice is a hybrid of the Ashtanga practice ( early Krishnamacharya) with which I was first introduced to yoga and the Vinyasa Krama ( later Krishnamacharya ) taught to me by Ramaswami. My morning practice tends to be a slightlyVinyasa Krama influenced Ashtanga Primary, 2nd and Advanced series followed by Pranyama, Pratyahara and Japa Mantra Meditation. My evening practice is 20 minutes Vinyasa krama subroutines, 20 minutes pranayama and 20 minutes meditation (including pratyahara). 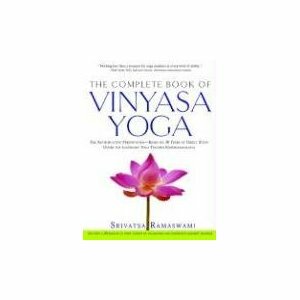 (Many who) have read the “Complete Book of Vinyasa Yoga” book... ask the question, what next? How can I do a daily practice from these sequences? 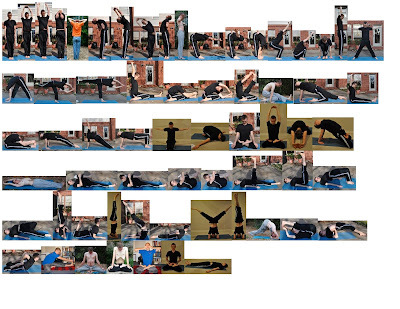 There are more than 700 asanas/vinyasas and I normally recommend doing each vinyasa three times. At the rate of about 4/5 movements per minute (it could be even 3 per minute for good breathers), it could take about 8 to 9 hours to do the complete vinyasakrama. Then my Guru would commend doing a short stint of Pranayama, say for about 15 to 30 mts and then chanting or meditation for another 15 to 30 mts, daily. We also have to consider that in asana practice, there are a few heavy weight poses which require one to stay for a long time. So it is almost impossible to practice all of it everyday even by a full time ‘practice-live-and-sleep-in yoga mat’ yogi. The book was written to give as complete as possible, a presentation of all the vinyasas in a series of sequences that is logical and easy to learn, as I learnt from my Guru. It is a book for learning the system. Any serious student of yoga who would spend years studying and teaching yoga should have in one’s repertoire as many asanas, vinyasas and logical sequences (krama) as possible. So, one should firstly study the entire range of asanas and vinyasas of the vinyasakrama system from a teacher say in the 60 hr vinyasakrama program. Then note down all the vinyasas that are a bit difficult to do. One should practice daily for half hour to one hour as many vinyasas as possible following the recommended sequence, with special emphasis on the difficult ones. In about six months to one year of consistent practice one would be comfortable with the system, the sequences and especially the required synchronous breathing. This would complete the learning process. Then one may prepare a green list of asanas and vinyasas one would be able to do and wants to practice regularly. There will be another list, amber list which would contain those vinyasas which are difficult now but one would like to practice them even if they are somewhat imperfect. Then there would be another red list which will contain procedures that are not appropriate or possible for the practitioner—which could probably be taken up in the next janma. Then it would be time for concentrating on using vinyasakrama for daily practice and also teaching to individuals for their daily yoga practice. However, as a general rule, for the serious mid-life yogi, a daily practice of about 90 mts to 2 hrs will be necessary and sufficient. After a short prayer, one could do a brief stint of Tadasana doing the main vinyasas two or preferably three times each. It should take about ten minutes. Then one subsequence in the asymmetric could be taken up, say Marichyasana or Triyangmukha or the half lotus. The choice may be varied on a daily basis. Five minute stay in Paschimatanasana and the counter poses may be practiced. Then one may do preparation of Sarvangasana and a brief stay in it, followed by headstand stay for about 5 to 10 minutes or more and then staying in Sarvangasana for 5 to 10 more minutes, if one can do inversions. Paschimatanasana, Sarvangaana and Headstand are to be practiced preferably daily for their health benefits. If time permits one may do few vinyasas in these inversions. One may do a subsequence of Triangle pose like warrior pose and /or one sequence in one legged pose. Mahamudra for about 5 minutes each on both sides can then be practiced. Then sitting in Vajrasana or Padmasana after doing some movements one should do a suitable variant of Kapalabhati, say for about 108 times and then an appropriate Pranayama, Ujjayi, Nadisodhana or Viloma with or without mantras for about 15 minutes to be followed by five minutes Shanmukhimudra and then chanting or meditation of about 15 minutes. The efficacy of Pranayama on the whole system and mind cannot be overemphasized. Please read the article on “Yoga for the Heart”, in an earlier newsletter... It refers to the benefits of Pranayama to the heart and the circulatory system. If interested, one may allocate an additional 30 minutes (or practice at another time in the day, say, in the evening) during which time one may practice a few subroutines from the other scores of sequences that have not been included in this core yoga practice. Everyday before the start of the practice the yogi should take a minute and decide on a definite agenda and as far as possible try to stick to the agenda. What asanas and vinyasas, which pranayama and how many rounds and other details should be determined before hand and one should adhere to it. It brings some discipline and coherence to one’s practice. It is customary to end the practice with peace chant. One reason why people nowadays look for a definite routine is because a few of the more popular vinyasa systems have a very small number of regimented sequences which are taught over and over again almost to all students. So there is a mindset that there should be a rigid sequence that is applicable for everyone, but that is not the way we learnt yoga from my Guru. Firstly the teacher should learn the whole system and then apply it to individuals as per the requirements -- pick and choose those vinyasa sequences, pranayama and meditation practices, dietary requirements, etc. The question that is to be answered is what does the practitioner want/need and how should the yoga routine be designed to get the required benefit. Vinyasakrama is like a yoga supermarket, and each one should put into the cart what one needs. And the term Vinyasakrama includes not just asanas but also other aspects of yoga like pranayama, meditation, etc. It is a progression of different aspects of Yoga. The Vinyasakrama has a huge collection of asana vinyasas, a well stocked section on Pranayama, then the meditation department and a spiritual study/contemplation section as well. So a lot of initiative should be taken by the individual consumer, like our practitioner who should take the responsibility of working out with the teacher how to design an intelligent purposeful yoga practice pertaining to oneself. To reduce Vinyasakrama to a standard routine as is done with several other contemporary Vinyasa systems and put it in a straight jacket is not desirable. I have explained these ideas to many participants of the longer versions of the programs and thought to touch upon them for the general reader who would be wondering how to force the VK elephant (or a camel) into the needle’s eye of daily practice. There are a few serious practitioners who have their daily routine cut out, but then do the complete vinyasakrama separately say in the evening for about an hour so that they could go through all the vinyasa sequences in a span of one week. There is no one rigid universal daily practice routine in Vinyasakrama as I have explained. 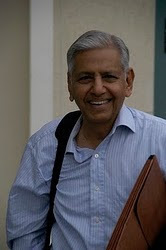 Ramaswami stressed the importance of covering a wide range of asanas to reach all areas of the body and recommended of his trainees that, if possible, they should try to work through all the Vinyasa Krama sequences over a couple of weeks perhaps in addition to their regular daily practice. Chris, who was on the Vinyasa Krama teacher training course with me last year has come up with a ten day approach to the series and I'd like to thank him for allowing me to present it below. Because of my Ashtanga practice in the morning I have a shorter Vinyasa Krama asana practice in the evening so am working through the sequences over a longer period, more like our my fellow blogger Arturo, but of course I cover quite a wide range of asana in the different series of my morning ashtanga practice. My own approach to Vinyasa Krama is strongly influenced by my Ashtanga background so I thought it would be interesting to show how somebody else approaches their Vinyasa Krama practice. I'm hoping blogger will blow these up when you click on them so you can actually see what's going on. You can approach this, as Chris is, as a ten day cycle covering most of the postures in Ramaswami's Complete book of Vinyasa Yoga or as ten independent ideas for structuring your practice. Ramaswami's Vinyasa Krama is highly flexible you, adapt the practice to yourself, practice what your able, work towards what's currently beyond you through practicing the easier postures. Ramaswami does recommend, however that you have a clear idea of what you intend to practice before you begin. I asked Chris ( he has a blog of his own here ) for a few lines concerning his yoga background. I almost never talk about my yoga biography but I will try: I started yoga at a gym and it was more or less a basic "gym" yoga. I stayed with this teacher for about a year and then he moved off and I was somewhat forced (I was guilt-ed into it) to teach yoga. This made me realize I knew nothing about yoga: how to structure the practice, the full Ujjiya breath etc. So, basically I taught in this confused state for about a year during which time I ran into Ricky Tran and he talked about his experience with Ramaswami which left an impression on me. After this year teaching, I ended up taking a TT course in Gaia Flow Yoga which was heated vinyasa. This class did teach me but I felt like it oversimplified things. After another year, I finally ended up taking Ramaswami's course. Basically, I wanted a more systematic approach to doing the asanas and working up towards pranayama. In general, my background is a bastardization of gym yoga and hot vinyasa yoga but I enjoy VK so much more then these though I also have a weak spot for ashtanga. That is the best overview I can give; I am also unsure on how these things affect my VK practice. Yes, the bullet points were just for you. Claudia, I think yours is the first comment on the new blog, thank you.